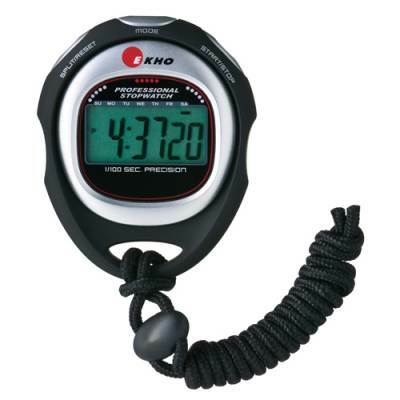 Help members of the team achieve a personal record with this EKHO K-150 Stopwatch. Whether you're timing athletes during practice sessions, trial runs or a real race, this stopwatch is great for taking precise measurements of both overall and lap times. Equip each member of the track and field team with a stopwatch during practice, so they can keep track of their own times and set individual alarms for a personalized training routine. This stopwatch is easy to read and use while running or exercising with the extra-large display and oversize buttons. The EKHO K-150 Stopwatch is a professional-quality stopwatch providing simple 1/100 sec timer with lap counter. It features oversized buttons, an extra-large display and a comfortable modern design. 1/100 second precision with lap counter (For the first 30 minutes).